Cunneto House of Pasta was highly recommended by David Chaplin AKA the Astronomer’s dad. Cunneto is located on The Hill, which is a predominantly Italian neighborhood in St. Louis with a large number of Italian eateries. 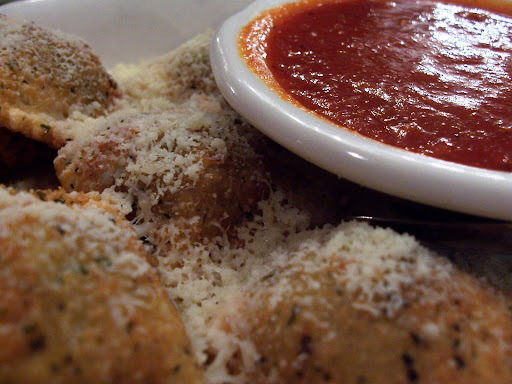 We started off our meal with an order of Toasted Ravioli because they are unique to St. Louis and it’s not very often that we find ourselves here. I have tried T-Ravs on a number of occasions while visiting the Astronomer at his home. As far as deep-fried food goes, T-Ravs are pretty good, but nothing spectacular. On the other hand, the Astronomer grew up eating T-Ravs, so they hold a very special place in his heart. I tasted little difference between Cunneto’s T-Rav and the frozen Louisa brand the Astronomer’s family mail orders. However, the Astronomer thought the restaurant’s T-Ravs were more delicate and softer than the frozen variety. I thought the marinara sauce was quite tasty. For my entree I ordered the Melanzane Parmigiano, which was an appetizer selection. Two layers of sautéed eggplants were topped with plenty of cheese and tomato sauce and baked to perfection. The eggplant was soft and sweet, the cheese was creamy and rich, and the marinara’s tartness balanced out the entire dish. 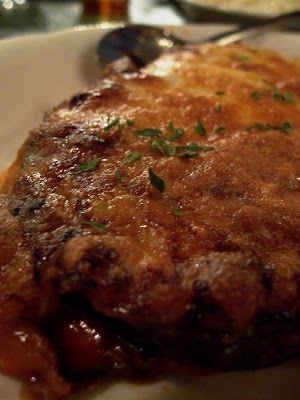 Needless to say, the eggplant parmesan was excellent and more than reasonably priced! The Astronomer could not pass up the opportunity to order pasta at a restaurant that proclaimed to be the “House of Pasta” and settled on the Ditalini con Piselli because he loves cream sauces. 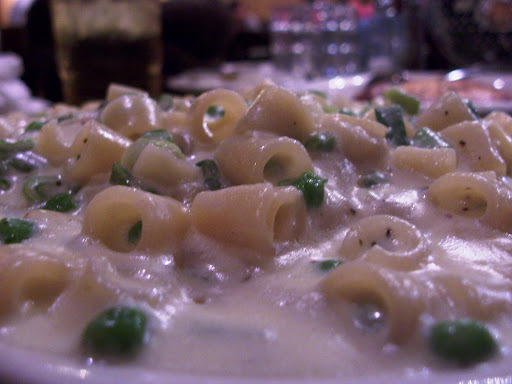 The Astronomer enjoyed the combination of flavors brought about by the peas, cream, and onions. I helped the Astronomer with his pasta and thought the green onions were an especially great touch because most Italian cooking uses white onions. Also, fresh green onions have spectacular flavor! The pasta portion was very generous, so we took a doggie bag to go. For the best St. Louis T-Ravs, try Charlie Gittos, just down the street from Cunettos. Everyone in St. Louis claims to have invented it, but Charlie may hold true title. Perhaps you could also uncover the horrible truth about what provel cheese actually is. No one around here wants to admit they know.